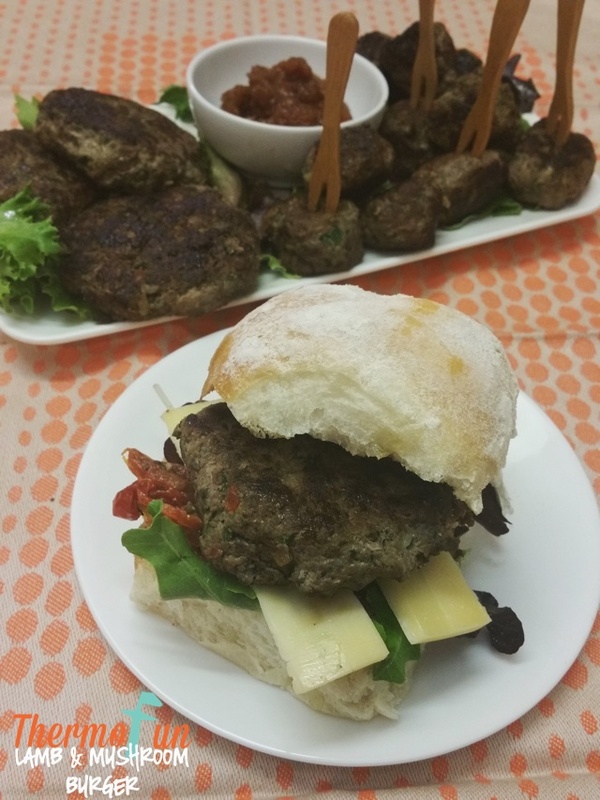 These burgers are amazing – particularly with some home made bacon jam and mayonnaise. These can be made into burgers or even small meatballs for party food and baked in oven. My daughter absolutely hates mushrooms and she had no idea they were in her burger! The lamb can be substituted for beef if you prefer. Place mushrooms and oil into TM bowl and sauté 5 mins / Varoma / speed 1. Remove mushrooms and place into a colander, lined with a couple of sheets of paper towel to absorb any moisture. Place parsley and garlic into TM bowl and chop 3 sec / speed 8. Add onion and chop 2 sec / speed 5. Add ThermoFun Middle Eastern Spice Blend, salt and pepper. Place another couple of paper towels on top of mushrooms and squeeze any more moisture out of mushrooms. Add mushrooms and mince into TM bowl and mix 5 sec / Turbo. Divide into burger patties and pan fry or grill on the BBQ. MINCING MEAT: I personally use round or rump steak to mince. I cut it into chunks and remove fat and sinew. It is important to remove all sinew where possible, as it does not mince at all well. Meat is easier to mince when it is partially frozen. However it still works if you are not organised enough to have it partially frozen. I mince 250g of meat at a time. To mince the meat I press the Turbo button for 1 second twice. Depending on the consistency you like you can do it for 3 or 4 times for 1 second each. These are so quick and easy. Love using my lamb in this dish, it’s always a winner with my 2 teenage boys and hubby. Yum Yum. Tonight my 14 yr old made us dinner. This was his choice, and it was delicious! The state of the kitchen afterwards perhaps not that great?. oh dear! Yes kids do like to use every possible thing they can in the kitchen!! lol!